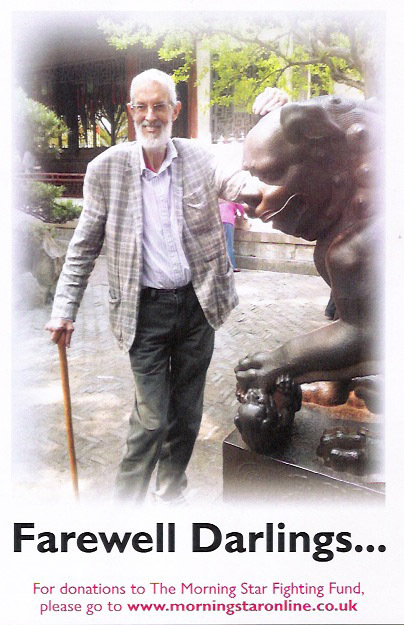 Yesterday I was privilaged to attend the funeral of a friend and comrade, the legendary Ivan Beavis, former circulation manager at the Morning Star, trade unionist, music collector, Man United fan, gig goer, and socialist. The ninety minute ‘event’ (Yes thats right – 90 minutes) had so many things – it is worthy of a report in the Morning Star itself! The packed room heard so many memories of Ivan – stories, poems, songs, humour, with speakers from his family and friends, former TUC President Rita Donaghy, comrades from far and wide, music buddies from Germany, Rob Griffiths General Secretary of the Communist Party and Star editor Ben Chacko. I mean where else would you have heard music by Curtis Mayfield, the Red Army Choir, Joe Cocker and Muddy Waters with Johnny Winter? Where else would you have heard about gigs at the 100 Club, the Flamingo and Joe Cocker concerts in Germany? Or Bruce Springsteen being turned down to play at the end of the People’s March For Jobs (not Ivan’s fault)? Booking Dr. Feelgood and bands for fund raisers? Record collecting and spending more that he should have on bootleg albums? His beloved Manchester United, Duncan Edwards and the Busby Babes? Poety by Leonard Cohen? Favourite bands such as the Graham Bond Organisation, jazz by Chet Baker and Miles Davis? The foibles and battles in the Communist Party and the founding of Unison? I first met Ivan when I joined the board of the Star. We clicked straight away he was a passionate Man United supporter, with an encylopaedic knowldge of the club and its history, he knew tons about music – almost anything – soul, blues, rock, jazz. He knew loads of obscure bands and got them to play fund raisers. He explained the problems of newspaper distribution of a small title and he used to ask me to tell him on which motorway and railway stations I saw or bought the paper, he used to moan to me when there were errors in the paper (he went nuts when the same back page was printed on consecutive days), he was the Unite Father of the Chapel at the Star, his humour was infectious and on leaving meetings or leaving saying goodbye at union conferences when he was running the Star stand he would end with a cheery “See you later dear! !” He was a legend. Below is John Haylett’s obituary from the Morning Star of January 17th – every word is true! 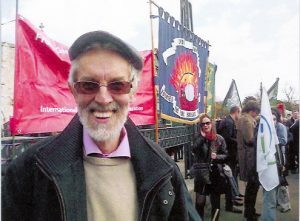 MANY Morning Star readers may know the name of Ivan Beavis from his personalised and witty columns publicising our paper’s Fighting Fund, but he was so much more than that. Ivan, who has died just short of his 70th birthday, spent two decades working at the Star — mainly as circulation manager, then campaigns manager and, in recent years, an inimitable Fund columnist. His children Naomi and Joseph have been struck by the breadth of tributes received by their mother and love of Ivan’s life Christiane Ohsan, asking how their dad was always able to be there for them with so much going on in his life. He was involved at national and grassroots level in his trade union Nalgo/Unison, his Communist Party, anti-racism and anti-imperialism work and international solidarity, notably with the struggles of Cuba, Grenada, South Africa and many more. Ivan was an avid collector of recorded music, especially on vinyl, and had an obsession — some termed it a perversion — with a football team called Manchester United. Hendy recalls being, with Ivan, “part of a significant grouping of young communists in the school,” where the Communist Party candidate was pipped by the Liberal in a school mock election. The labour movement lawyer only ran into Ivan years later when he became the fundraising face in the Morning Star and they continued where they had left off all those years before. On leaving school, Ivan went to work at Middlesex County Council, later to become the Greater London Council, where he joined Nalgo. Ivan got married at this time and this union produced children Natasha and Matthew, who tweeted: “So proud to call him my dad. RIP comrade xxxx” in response to earlier tributes to Ivan on our paper’s Twitter feed. Despite his communist flirtation in school, Ivan’s first introduction to real politics was with Peter Hain’s Young Liberals in the direct action demonstrations against apartheid South Africa’s rugby team. However, it was Ivan’s growing contacts with communists in the Anti-Apartheid Movement and in his union that convinced him to join the Communist Party rather than any resentment over his rough treatment at the hands, or feet, of the Metropolitan Police. He met Christiane, who was also active in Nalgo, in the late 1970s, supporting an alternative candidate for a seat she was contesting on Hackney branch’s executive committee. “I was elected and he got over it,” Christiane remembers with a smile and the pair got together during preparations for a Greater London Association of Trades Councils solidarity delegation to the Soviet Union in 1980 in response to a US-orchestrated campaign to boycott the Moscow Olympics. Christiane joined the CPGB shortly after that, just in time to witness Ivan’s expulsion as one of the “London 22” — members of the party’s London district banished for refusing to accept an EC edict to cancel the LDCP biennial congress. Fellow expellee Mary Davis recalls Ivan being in the “belly of the beast” — her designation of the party’s Hackney borough organisation — where the Eurocommunist faction intent on ridding the party of people like Ivan had established itself. “Ivan refused to buckle to threats and continued to support the right line,” she says. Christiane’s CPGB card was not renewed and, although she attended meetings of the Communist Campaign Group, the forerunner to re-establishment of the party as the CPB in 1988, it was not until 2006 that she rejoined. As dispiriting as this was for Ivan, he had plenty to do in Nalgo, being elected first as Hackney branch secretary, Met district region secretary and then to the national executive council (NEC). “It is his time as Met district region secretary for 10 years when most of us got to know Ivan. It was a bit like white water rafting,” suggests former national president Rita Donaghy. “Our fortunes often followed the same path both in elections to the NEC — we were elected and kicked off in the same years — and when we both got a mention in [former electricians’ union leader] Frank Chapple’s column in The Sun in July 1985. “Typical of Ivan that he always tried to soften the blow,” she says. Union conferences are, of course, important for more than simply the cut and thrust of debate. Delegates must be entertained in the evenings and Nalgo was blessed with imaginative organisers of social events. “Ivan was the only man I know who could sell 600 tickets for a 300-person venue,” says Donaghy, who remembers that delegates knew not to clash with the Morning Star night he and other comrades organised. “He was plain-spoken and able to explain political theory and strategy in the simplest terms without resorting to non-comprehensible and boring dialogue. In doing so, he demonstrated an infectious sense of humour — a quality he retained over the years in his role as fundraiser for the Morning Star. And what a godsend to the Morning Star’s coffers were those fundraisers that Ivan and his Haringey comrades Steve Powell and John Marsh took the lead in organising, with top-notch acts so delegates knew that they wouldn’t be fleeced at the Star social. It was literally unmissable. “Many decades ago at a packed Morning Star social at Nalgo conference with the band Dr Feelgood that I’d helped organise, Ivan approached me, somewhat unsteadily having ‘had a drink taken,’ as the Irish say,” Powell recalls. “‘Darling,’ Ivan announced, ‘I’m rolling in money.’ I pulled him into the venue manager’s office where Ivan produced wads of bank notes and cheques from every pocket. Mancunian Marsh was suspicious of Londoner Ivan’s footballing affiliation until he recounted quality time spent with his estranged father, who had moved back up north, at Old Trafford watching the Busby Babes before they tragically died at Munich Airport. His roll call of the musicians of all genres that Ivan persuaded to play for the Morning Star, the African National Congress, the National Union of Mineworkers during the 1984-5 national strike and other causes reads like an A-Z of popular music. “Ivan raised all the funding and monies for these events. All the profits went to respective causes,” Marsh stresses. Highlighting the way Ivan used humour to make political points, Marsh recounts his response to harassment by “anarcho-liberals” seeking to impose supposed emergency motions on him by submitting his own. Ivan acceded to a withdrawal request by the standing orders committee, who feared that, as it was technically in order, conference might well pass it. He pays tribute to Ivan and team for organising the South Africa Women’s Day celebration in Finsbury Park in August 1987, when US communist Angela Davis and ANC chief rep Ruth Mompati headed the bill and drew thousands of people to the park and into solidarity action behind the South African liberation movement. “It was comrades like Ivan who assisted us in many ways to gain freedom in South Africa,” says Bham. He bids farewell to his comrade in traditional South African manner. “Hamba Kahle, Ivan. Amanda Ngawethu” (Go well, Ivan. Power to the People). To try to list the countries for whose people Ivan worked in solidarity would be to risk missing some out, but Grenadian Jacqui McKenzie remembers Ivan’s role in winning Nalgo support for her island’s brief revolutionary experiment from 1979 – 1983. His work escalated, however, when, using the pretext of the killing of revolutionary leader Maurice Bishop in October 1983, US president Ronald Reagan ordered 10,000 US marines to invade the island of fewer than 100,000 people. “Ivan was instrumental in getting Nalgo to pass resolutions to condemn the invasion and could often be seen at the many meetings and marches organised in defence of the revolution and at the many pickets of the US embassy,” McKenzie recollects. His work was largely responsible for Nalgo national conference passing a resolution in June 1988, condemning the unconstitutionality of the Grenada 17 political trial. Ivan didn’t know how to wage a half-hearted struggle. He gave his all and was widely loved for it. While the movement mourns, Christiane and family behold what she calls “a huge, massive hole” where once he stood. His tendency to call everyone ‘darling’ avoided the possible embarrassment of forgetting comrades’ names, but it also reflected Ivan’s unchallenged status — just as Lenin once once called Bukharin the darling of Russian Bolsheviks — as the darling of not just Britain’s Communist Party or the Morning Star but much further afield too. This entry was posted in Blogs, European Trade Unions, International Trade Unions, Labour Party, Media, Politics, Solidarity, Trade Unions, Trades Union Congress, Unite The Union. Bookmark the permalink.